Six years after the spectacular event no one in the village of Santa Vitoria do Palmar was still thinking about the fireball of June 1997. Roberto Maciel also had different things in mind as he was walking at the foot of the Holocene sand dunes at the edge of the Mirim Lagoon where he was prospecting for Indian arrow heads. But on March 25 or 26, Maciel made a discovery that reminded him of the fireball that he had witnessed six years prior. Through the surface of the otherwise boulder free marine sediments protruded a large dark stone which he immediately dug out. The remarkable black rock seemed rusty on some parts and displayed a number of distinct depressions shaped like Fingerprints. Approximate find location of the 10.45 kg Correia masses. 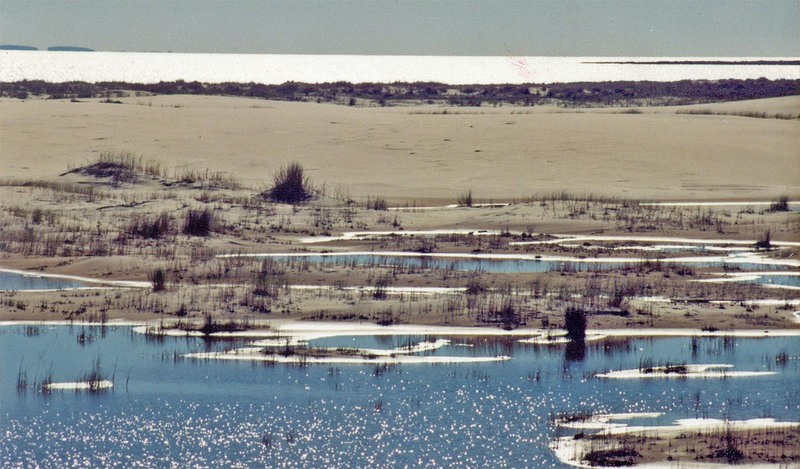 This is a flood plane at the southern tip of the Mirim Lagoon which can be seen in the background. Picture was taken viewing north. Image courtesy of Monzon Pereia. 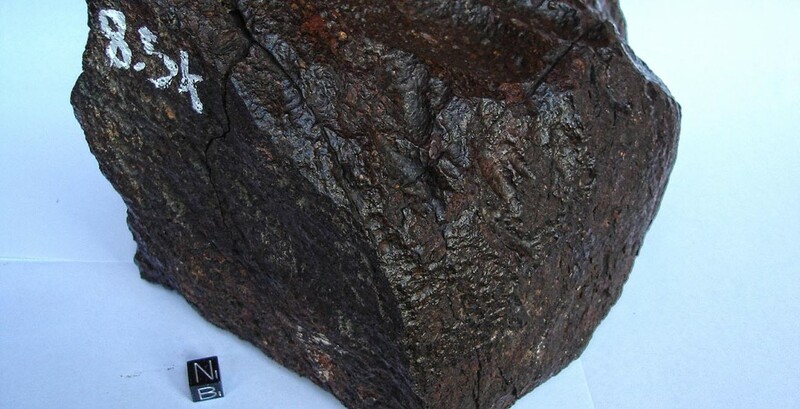 Roberto Maciel was convinced that the 34 kg rock he had just discovered wass a meteorite. To him the piece of rock could only have been deposited there by the 1997 fireball. Maciel continued his search the following days and weeks, now with the goal of finding more meteorites instead of arrowheads. And his efforts were rewarded with success. He found two more masses, 4340 gm and 1570 gm respectively. At first the news of Maciel’s discoveries did not arouse much interest in the rural community. But then the word reached Josemaria Monzon Pereira, the curator of the local Museum, he was instantly thrilled. Pereira immediately grabbed the phone and contacted Maciel, a meeting was soon scheduled. And Pereia did not only succeed in acquiring the two smaller masses for the Museo Municipal Cel. Tancredo F. de Mello Brazil, he also conducted the first documentation of the find location and circumstances. It is because of Pereia that both masses are preserved intact until now. Together with a small selection of other South American meteorites they are accessible to the public in the exhibition of the Museo Municipal Tancredo F. in Santa Vitoria do Palmar. “One Sunday morning my father took the stone with him to a get together with other locals. He went off to a nearby fazenda and returned without the stone. He explained to my family that he had given the stone to an old geologist from the University of Rio Grande del Sul in order to study the meteorite. I do not remember the name of this scientist. I know that the stone weighed 34 kg and that it had the same texture and appearance than the two smaller stones which he gave to the museum. With the one exception that the larger stone was more black on some parts than the others.“ said Francisco Maciel. Pereia’s inquiries to identify the current possessor of the stone at the University of Rio Grande del Sul and among the relatives and friends of the finder which he continued for more then two years lead to no further clues. The 34 kg mass was considered lost until it suddenly re-appeared in mid 2009, when it was found in the garden of local, resting on a chair. While it was positively identified as the lost SVdP main mass by initial members of the Investigation team, it remained unclear how or when it ended up at its second find location. Among those, who had learned of and had had the chance to investigate Roberto Maciel’s finds in August 2003 was Lautaro Correia, a local rockhound and fossil expert from Santa Vitoria do Palmar. As a passionate aficionado of the local fossil deposits, Correia was familiar with the find Zone, which is famous for its marine sediments. From then on Senór Correia made more frequent field trips to the strands of the Mirim Lagoon. On February 14. 2004, he was again prospecting the fossil deposits within sight of the Mirim Lagoon. Close to a huge fossil whalebone he spotted a dark rock two thirds embedded in the sandy soil. 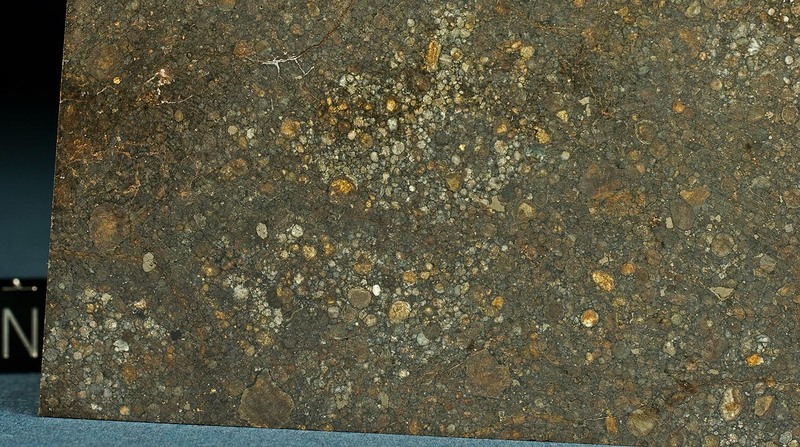 After uncovering the regmaglypted rock, he recognised its close similarity to the material found by Maciel the previous year. The find position is not far from the site of the Maciel finds which is given as 33°30’56’’ S, 53°24’65’’ W. A joint survey with Senór Pereia did not yield further finds. On December 24. 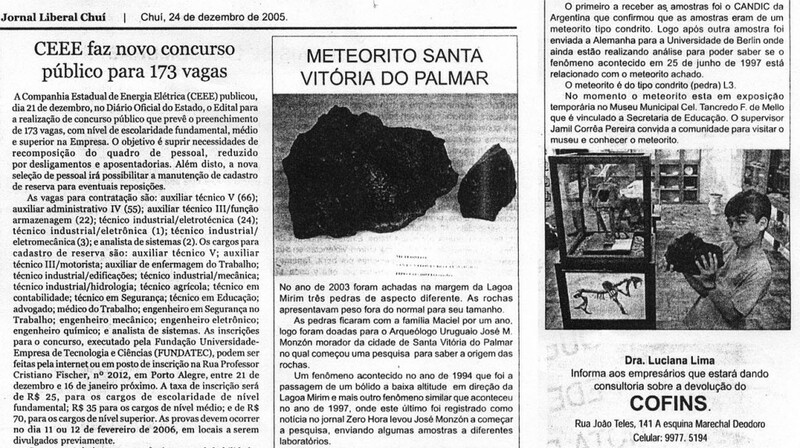 2005, under the headline „Meteorito Santa Vitoria do Palmar“ the „Jornal Libarai Chui“ published a report on the meteorite issue with particular focus on the finds and their exhibition in the local museum.